Add a splash of citrus to your beverage with this easy-to-use Sombrero bottle-top juicer from Umbra. Simply place the juicer into the top of your beverage container and quickly juice a lemon or lime right into your drink. 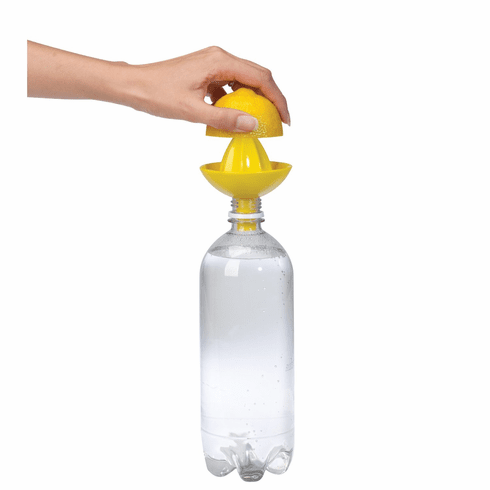 Works with most standard water, sparkling water, juice, soda and beer bottles. Comes apart for easy cleaning. Food-safe and FDA-approved. Great for parties, barbecues, and folks on the go! Juicer measures 3-1/4-inch diameter by 4-inch high. Patent pending design by Mauricio Affonso for Umbra - the worldwide leader in innovative, modern, casual and affordable design for the home.